Here you can watch Live Sea Lion Webcams located at zoos around the world as well as in their natural environment. This Sea Lion Cam comes to you live from the Osnabruck Zoo in Germany and features Sea Lions swimming in their pool. The zoo feeds the sea lions live at 11:00 a.m. and 4:00 p.m. local time in Germany (which would be about 5:00 a.m. and 10:00 a.m. Eastern Time in the US). This cam has streaming video and remote control so you can pan, tilt and zoom. Watch the Sea Lion Cam in Germany. 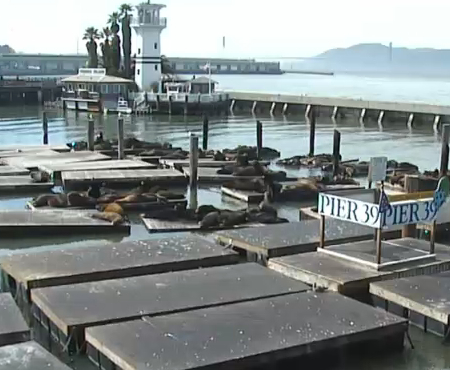 This is an AWESOME Sea Lion webcam and is comes to you live from San Francisco’s famous Pier 39. These sea lions started taking over the docks in January 1990 shortly after the 1989 earthquake. At first there were about 10 to 50 of them, but due to the abundent supply of fish and available dock space, the population grew to 300 in a few months. In the winter, the population grows to around 900, most of which are male. Prepare to be amazed as this cam has streaming video, sound and is in HD! Watch the Sea Lion Web Cam at Pier 39. This webcam gives a view of the Sea Lion Caves in Florence, Oregon. You may or may not be able to see Sea Lions, but stay tuned as I won’t be surprised if they upgrade their webcam in the future. Check it out! Watch the Sea Lion Caves webam in Oregon. Watch Sea Lions swimming, playing and relaxing in this habitat at the Pittsburgh Zoo. Camera has streaming video and is in color. Watch the Pittsburgh Zoo Sea Lions.